We swapped the cranberry jelly for strawberry preserves to make this tasty turkey sandwich—and turned to Granny Smith to get some crunch in there, too. Spread reduced-fat cream cheese onto 1 bread slice; spread preserves onto remaining bread slice. 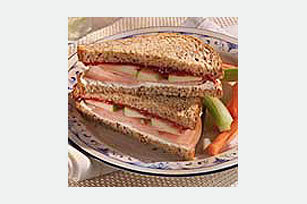 Fill bread slices with turkey and apples. Enjoy the rest of the apple along with your sandwich. Substitute your favorite split savory-flavored bagel for the bread slices.